2006, “Aim High” (2006 FRC Game Animation), consisted of a rectangular field with three goals at either end – two located at ground level lateral to the high goal centered above the drive teams. Directly underneath the central target was a ramp leading up to a platform essential in the endgame. Using preprogrammed instructions, robots tried to score foam balls into the goals during a 10 second autonomous period. Whoever gained the most points in autonomous received a 10 point bonus, although their top goal was temporarily deactivated. In the following tele-op period, the alliance with the activated goal attempted to score while their opponents played defense and were limited to scoring in the bottom goals. During this time, robots could be fed balls from human players or retrieve them off of the floor. At least one robot had to remain on their side of the field at all times. Later on in the match, the activated goal switched sides, therefore switching the alliance from offensive to defensive and vice versa. This maneuver added variety to the game. In the final moments of the game, both top goals were reactivated and 25 bonus points were allotted to alliances with all of their robots positioned on top of their lifted platform by the ending buzzer. One point was awarded to every ball scored in the bottom goals, and three points to every score in the middle target. 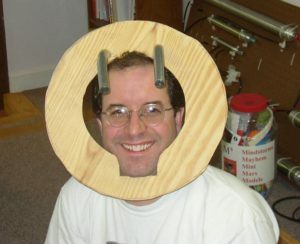 As we started the 2006 build season, we suddenly found that our team had grown. 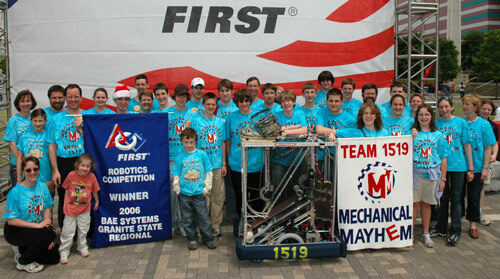 At the FLL state tournament, our FLL team Mindstorms Mayhem won the Director’s Award for the third consecutive year. But this year they declined the invitation to go to the FLL championship in Atlanta in April, allowing Mach 6, the Director’s Award runner up and other FLL team supplying original members to our FRC team, to go instead. This enabled some of the older Mindstorms Mayhem FLL members to come join the FRC team for this season, and freed up two of our coaches from having to worry about FLL and FRC teams simultaneously. We gained a new student from a neighboring Christian school as well. Then on the very day of kick-off we gained a new student who had heard about us online. He brought two other friends with him to join the team. We went from 12 students the year before to 21! 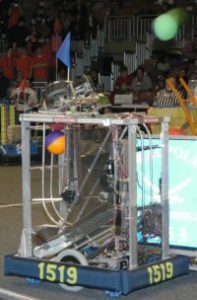 After kickoff for the 2006 “Aim High” we correctly recognized that scoring in autonomous mode was key to winning the game. This was exciting, since autonomous programming plays well into the hands of a team full of FLL champions! Coach Ken wearing our shooter ring… ()what does it look like to you? This year we actually finished the robot before we shipped it. Testing was still a bit skimpy, given that it was winter in New Hampshire, and neither Mayhem Central (the Gray’s basement) or our practice area at Cirtronics have much ceiling clearance. We set up the practice goal and started firing away outdoors at one in the morning before ship date. The robot, which came to be known as “Sergeant York,” performed well, to great celebration. The neighbors were not celebrating, however, and called to see what was going on. Shipping a complete robot helps. This improvement over 2005 showed at the Granite State Regional where we went 5-2-2 and were the #8 seeded team. After the alliance pickings we found ourselves paired with the 7th seeded team, Kaizen Blitz (1276), and BERT (133). With them we went on to win the regional! This gave us the opportunity to attend the 2006 Championship in Atlanta, Georgia. After frantic fundraising and making travel arrangements, we were off to Atlanta. What a trip! We knew before we even arrived that being in the Newton division would be hard, but God blessed the team’s efforts. We went 5-2 in the qualifying matches, and were seeded 9th. After #1 seedAces High (176) picked within the top 8 we ended up selecting and captaining the #8 alliance with Trinity (40) and team Precision Guessworks (1646). We played against Aces High’s alliance in two quarter final matches before being knocked out of the running. We watched as the Newton Division champions went all the way to the finals on Einstein Field. Before the last match on Einstein, one of the Archimedes Champions’ robots desperately needed a master link for a chain. Showing the gracious professionalism found only in FIRST®, the Newton Champions provided the needed chain link to their opponents. In the end the Archimedes Champions claimed the victory at Einstein. So exciting to watch! Team 1519 arrived safely home and immediately began planning for the summer tournaments coming up. Other than some battle damage repair, the Sergeant was in good shape and continued to perform well. At Beantown the robot went 5-2 and was the #4 seed. We were joined by the Rhode Warriors (121) and Southie Knights (team 1919). We all fired away for three rounds each in the quarter finals and semifinals before bowing out. At Mayhem in Merrimack we brought two robots. The second robot, using parts from our 2005 robot “Elvis,” was designed and constructed in three days. Although one of the Sergeant’s shooter motors smoked in the second round, and we initially botched the repair, the sharpshooting Sergeant went undefeated all day! For the playoffs we selected our 3-day ‘bot “Elvis Reloaded” (it had placed 9th) and were able to go all the way to the championship. Although we don’t recommend compressing the build season to 3 weekdays, it was certainly an instructive exercise! It was a thrill to take such a fine machine to Battle Cry. The Sergeant did not disappoint, going 6-0-1 in the qualifying rounds to take the top seed. We were joined by two excellent partners in Sparx (1126) and the Cyber Knights (195). In the eighth-finals, our alliance scored an amazing 101 points! With that score and another win, we advanced to the quarter-finals. In the quarter-finals we went to three matches. Unfortunately, 1126, one of our alliance members, lost a drive train chain. We called a time out, but it wasn’t enough. The other alliance, led by the Mechanical Maurauders (271), showed the Gracious Professionalism® FIRST loves so much and gave our alliance their time out as well. 1126 got their drive train fixed, but just as they were getting ready to put the robot on the field, the countdown for the match started. The match was exciting and a great battle, but our two-robot alliance just wasn’t enough to beat the three-robot alliance we were facing, and the match ended with a score of 54 to 31 advancing the other alliance to the semi-finals. We went undefeated for the day at River Rage, frequently scoring all ten balls in autonomous mode! It was an incredible way to finish out a very successful season.